Professor Lisa Dufraimont joined Osgoode Hall Law School in July 2015. She teaches and conducts research in the areas of criminal law and procedure and evidence. Prior to joining Osgoode, Professor Dufraimont held a faculty position at the Queen’s University Faculty of Law, where she began teaching as an Assistant Professor in 2006, became an Associate Professor in 2012, and served as Acting Associate Dean (Academic) for the first half of 2015. She earned her JD from the University of Toronto Faculty of Law, and was awarded both the Gold Medal and the Dean’s Key. She also holds an LLM and JSD from Yale University. 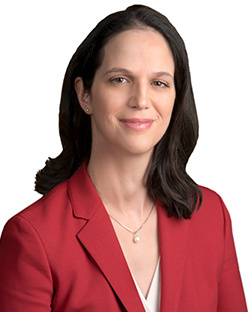 She served as law clerk to the Honourable Justices Catzman, Carthy, Laskin and Rosenberg at the Court of Appeal for Ontario and was admitted to the Bar of Ontario in 2003. Professor Dufraimont has published extensively on subjects related to criminal law and evidence, with a particular focus on the jury system and the psychological aspect of procedural and evidentiary rules. Her work has appeared in edited collections and in leading law journals including the McGill Law Journal, the Queen’s Law Journal, the UBC Law Review, the Supreme Court Law Review, the Canadian Criminal Law Review and the Criminal Law Quarterly. She was Co-Investigator on a SSHRC-funded psycho-legal research project investigating the effects of Canadian jury pattern jury instructions on the criminal standard of proof beyond a reasonable doubt. She is co-author of Evidence: Principles and Problems, 10th ed. (with Delisle, Stuart & Tanovich, 2012) and Canadian Evidence Law in a Nutshell, 3rd ed. (with Delisle, 2009). She is Associate Editor of the Criminal Reports and a regular contributor to the National Judicial Institute’s Criminal Essentials Eletter, which is distributed monthly to about 1000 Canadian judges. Professor Dufraimont presents regularly at legal and judicial education seminars. While at Queen’s, she received the Law Students’ Society Teaching Excellence Award. Graduate Research Supervision (LLM, PhD): Professor Dufraimont is interested in supervising excellent graduate students in the areas of criminal law, criminal procedure and evidence. She is particularly interested in the psychological aspect of evidence rules, and her current research interests include expert evidence, witness credibility, evidence problems in sexual assault, and the regulation of interrogation and confessions. Professor Dufraimont is currently involved in funded research studying the interplay of the use of language interpreters with questions of witness credibility and the detection of deception.